Busy weekend here in the Brimful home. My son is ill with a cough, my in-laws are here for a visit, and I took all my small kids' clothes over to a friend's house for the garage sales this weekend. Unfortunately the weather here is awful and not many are willing to brave the cold and rain for bargains. So I'm tired, cold and I'm not feeling very productive anymore this evening. That means no Full to the Brim this week. So sorry. I did "tweet" several book giveaways earlier in the week, so check my twitter site (iambrimful) to enter those. I currently have a great giveaway posted for a book I absolutely love, Toad Cottages & Shooting Stars by Sharon Lovejoy. It's a super resource for fun and interesting activities to do with young children. My favorite chapter is titled "Kitchen Garbage Garden." 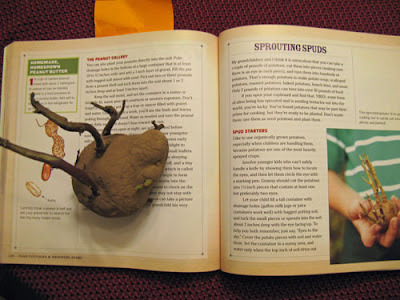 There's a whole section on sprouting spuds, and I'm proud to say that we've managed to produce a strange looking "alien" potato perfect for using as a seed potato. (See it in the photo to the right?) My daughter can't wait to cut it apart and try growing it in a container. We're going to try forcing a sweet potato to leaf out in a vase with water, too. The giveaway for this book ends on Monday so take some time and enter for a chance to win a copy for yourself! Additionally, now through May 14, don't forget to vote for your child's school online in the "Way to Grow" sweepstakes at www.landsend.com/thehub for a chance to win up to $2,500 for gardening and science programs. Thanks so much for your kind words! Keep up your GREAT work. I feel your pain. Both of my kids are fussy, running slight fevers, not sleeping well, clingy and snotty! I wanted to get a lot done this weekend, but it's not happening. I'll be lifting you and yours up in prayer. I love the title of your post and your blog name. I am always using the words *filled to the brim* or *full to the brim*....thinking of all the richness life and nature has to offer us ...abundance and plentitude. This looks like a great book! I just submitted a request for my library to purchase it!! !